Ranveer and Sara have taken it to the next level with memes. Though a newbie in the entertainment industry, Sara Ali Khan is ruling over the hearts of audiences with her scintillating performance in Kedarnath. And now she is gearing up for her next release, Simmba, starring Ranveer Singh. During the promotions of Simmba, the team is often seen cracking jokes and participating in singing sessions. Now Ranveer and Sara have taken it to the next level with memes. 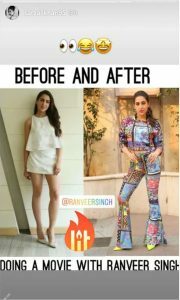 On Saturday’s Bigg Boss, Sara Ali Khan mentioned that people are making memes about her changing fashion choices ever since she has started working with Ranveer Singh in Simmba. 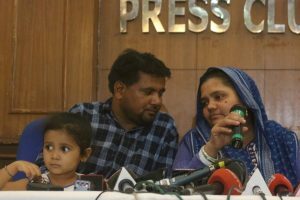 Not just that, on Sunday, she shared a meme of herself – a photo collage of her outfit choices before and after doing a film with Ranveer Singh. In the ‘before’ version of the picture, she is seen in a subdued white attire and in the ‘after’ version in a whacky, multi-coloured outfit. 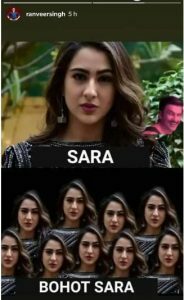 Simmba star Ranveer Singh also shared a meme in which there is a pun on Sara Ali Khan’s name. Here is the meme shared by Ranveer Singh. The two are having their best time during promotions and no doubt their appearance on interviews and shows are a laugh riot and is a must watch. Here is a mini clip showing from promotion which will leave you in laughing state. Simmba is directed by Rohit Shetty and helmed by Karan Johar’s home production Dharma Productions. The film stars Ranveer Singh, Sara Ali Khan, and Sonu Sood, and is slated to hit the theatres on 28 December 2018.